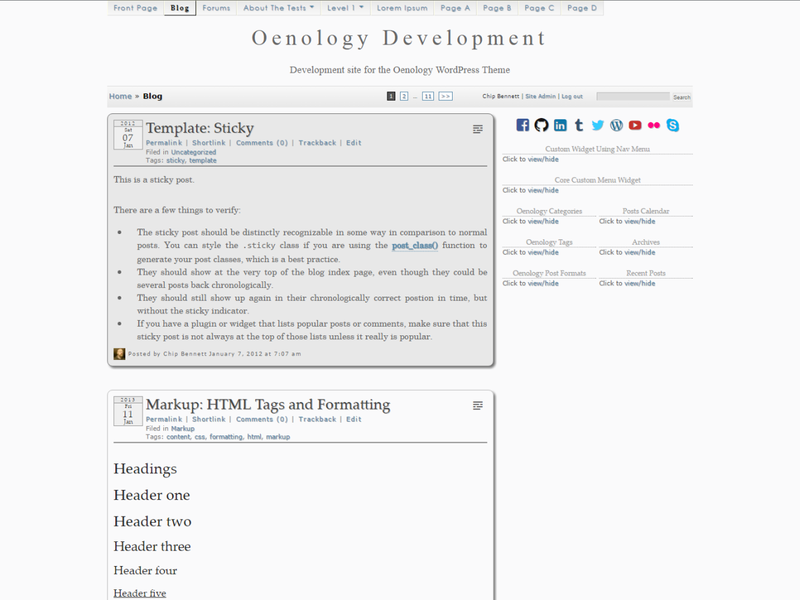 Oenology is designed to be a simple, minimalist, yet feature-complete and fully documented Theme intended to serve as a base for child Themes and as an educational reference for Theme development using WordPress functions, action/filter hooks, and template tags. Oenology includes built-in breadcrumb navigation, and supports the Theme Customizer, Contextual Help, Post Formats, Navigation Menus, Post Thumbnails, Custom Backgrounds, Custom Image Headers, and Custom Editor Style. Oenology features a responsive design, and includes plug-and-play support for the WP-Paginate and Yoast Breadcrumbs plugins. Requires WordPress 3.5, and is compatible up to WordPress 3.8.